e-Challan happens to be one of the comprehensive digital solutions for traffic/transport enforcement. With this technology, the traffic cops can manage to save their valuable time and focus on the traffic situation. The paperless system help personnel for speedy challans. Ever since a crackdown on errant vehicles began in the month of April at the Yamuna Expressway, around 50,056 challans have been issued in the past few months for exceeding the speed limit on the corridor that connects Greater Noida and Agra. On an average, more than 800 vehicles are caught speeding daily. According to traffic police data, since the beginning of this year, 296 traffic violators were penalised on the expressway in January. The average traffic penalties in the mid-April to mid-June have been about 25,000 times higher than the first three months of the year. “Physically stopping speeding vehicles on an expressway is difficult and dangerous for the police. It is also risky from a road safety perspective. Integrating cameras with the e-challaning system has helped penalise more violators and they are intimated about it immediately at the toll plaza, which helps keep them in check”, said, Anil Kumar Jha, Superintendent of Police (Traffic), Noida. Vehicles riding over 100km per hour are recorded by cameras installed along the expressway. The driver is issued a challan slip at the toll plaza, informing him/her about traffic violation and the speed of the vehicle. The system is linked with the e-challan and Vaahan applications of the government, and a challan is generated instantly by the police at the traffic enforcement centre at the toll plaza. Violators who have been issued the ‘speed cam violation slip’ at the toll can pay the Rs 400 fine for speeding at the police window near the toll plaza. Those who do not pay the fine instantly can visit the SP traffic office in Noida to pay the challan amount within seven days. An ambitious traffic laws’ enforcement project, ‘one state one e-challan’ – which seeks to integrate the e-challan system across Maharashtra is likely to be operationalised soon. As part of the proposed scheme, the traffic police will be able to serve offenders uniform e-challans, irrespective of the district or city where the violation occurred. The traffic police headquarters will be the hub from where the e-challan updates will be controlled. In order to be armed with e-challan machines, the traffic police have ordered 4,500 handheld devices, which will provide details of any pending e-challans that might be registered in the name of the vehicle. The project rolled out in the month of June has been set up in five separate cities of Maharashtra in the first phase of the project. The cities that are included in the first phase are Mumbai, Thane, Navi Mumbai, Pune and Nagpur. During the first phase, the main hub of traffic control will be set up in Mumbai’s traffic headquarters in Worli. However, the state centralised operations headquarters will be later set up in the state highway police’s office in Mumbai as part of the second phase of the project, which will include all cities in the state. Similarly, if you are caught violating traffic rules on city roads of Vadodara, the traffic cop will now simply pull out his smartphone and click the photo of your vehicle’s registration number. An e-challan will then reach your residence in the next few days. To smoothen traffic flow in the city, police have decided to crack down on rule violations. 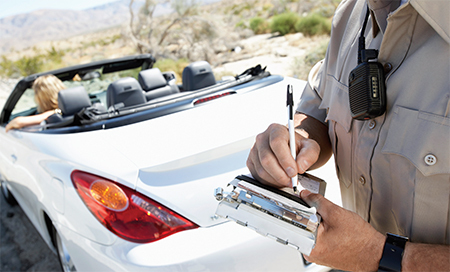 To make sure offenders are penalized, cops have taken to technology. “A special mobile application has been installed on smartphones of head constables. When they see a traffic rules violation, all they have to do is intercept the offender and click a photo of the vehicle’s license plate using the mobile app called Vadodara Traffic Police (VTP),” informed police personnel from the traffic department at Vadodara. The smartphones of these cops have been connected to our software in the police control room. When they enter the photograph of the licence plate and details of the driver, the information will be fed into the e-challan section at the control room. An e-challan will then be generated and sent to the address of the offender. The aim of the system is to identify offenders on the spot and make sure they are penalized. Police is already using CCTV cameras to identify and penalize those driving on the wrong side, jumping signals and riding twowheelers without helmets. E-challans are being sent to the residences of offenders. Also, on-the-spot photographing of vehicles and sending e-challans is expected to discipline commuters. Previously e-challans were only issued to those who had broken rules where CCTV cameras were present. Now with the introduction of newer technology, rule-violators do not have much chances for getting away.